Besides the obvious, the paint and all new bedding, I changed up some of the other pieces. I took out our wobbly little night stand and brought in this sweet side table my dad made in his 1949 shop class. He refinished it two years ago and gave it to me. I had it in my office for a while and then it got moved out to the storage shed. He did a great job on the refinishing and you would not believe how sturdy this thing is. I took down a fake oak shelf that used to take up residence on this wall and added a trendy stamped metal shelf with some fun copper rubbed detailing. The little sign makes me smile. I hope it will serve well as a reminder to Captain Cavedweller since it is on his side of the bed. I pulled in decor pieces I had in other parts of the house. The beautiful bowl in the center there is as heavy as a quarter ton of bricks and I love it. The base is sculpted glass roses and it is awesome. And yes, it was a gift from Captain Cavedweller. He knows my addictions well. One of my most favorite new additions was this sign that I found at Hobby Lobby. There is the slightest, most remote possibility that I may perhaps get a little sappy when I read it. Maybe. Just a little. See the marvelous throw pillow in the middle? Again, found that at Hobby Lobby. It is a perfect match! 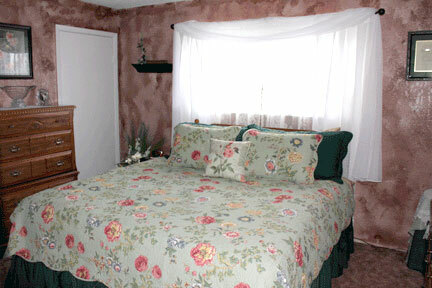 Oh, and all that wonderful bedding from Private Quarters that led to the makeover? It is beyond wonderful. The sheets are amazingly crisp yet soft, the mattress pad is like sinking into sheer bliss and the pillows, oh, my, those pillows are they ever delightful. Share your thoughts! I’d love to hear what you think of the bedroom makeover. Wow, great job. The room looks so much more interesting! And i love that Hobby lobby sign! Thanks so much! It was a lot of fun!